Fridge-shopping got you hot under the collar? Chill out, our list of the best refrigerators and fridge-freezers has got you covered, whether you want a whopping American-style fridge or a slimline budget model. It’s easy to forget that the humble refrigerator, which so many of us take for granted, didn’t appear in the majority of British homes until the 1970s — now, it’s a firm feature in every kitchen. And how far they’ve come, too. A very, very far cry from the earliest fridges, today’s remarkable refrigerators boast all manner of wild and wonderful features, functions, and (let’s be honest) fripperies, from convertible compartments to calendar calibration, wine racks to Wi-Fi. On the upside, the prevalence of fridges means we’re also spoilt for choice when it comes to premium functionality at a less-than-premium price. If you’re prone to trawling the reduced section for a slightly-on-the-soft-side bargain, or forgetting about the odd courgette or carrot, most of these modern fridges will see you right, with superior air flow, freezing and antibacterial technology to keep things fresh. Big families will often need a big food shop, especially if you have growing teenagers who hoover up anything in sight, so go for a model that has enough storage to see you through the week, plus emergency reserves for unannounced guests. If you have the space, a side-by-side American-style fridge freezer is an excellent option, and will usually boast little extras like a waterspout or ice-makers making them the best fridges for big families. If you don’t have the space for an all American refrigerator in your kitchen a slender top-to-bottom model still offers most major functions in a smaller footprint, the only bonus you have to sacrifice is storage space, which may not be a problem for smaller households. Brands such as Smeg are one to look out for if you want a happy compromise. Whatever style you go for, keep an eye on each fridge’s noise level (listed below in decibels) and energy efficiency rating (listed on impressively efficient picks) for maximum peace of mind. Smart home adopters will be pleased to hear that fridges are in on the tech game too, with smart fridges now making an appearance in our round-up. Everything about this fridge freezer is overwhelming, from the number of doors (four!) to the huge capacity. But mostly, it’s the sheer smartness of it all. 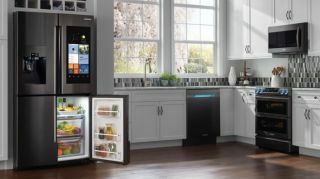 State-of-the-art technology abounds in the Samsung Family Hub Smart Fridge, with CoolSelect enabling conversion of one section into extra fridge or freezer space, a Wi-Fi enabled touch screen to coordinate calendars and re-order supplies, and even built-in interior cameras, so you can finally find out who’s been eating the good cheese (it’s actually a high-tech way of making a shopping list while you’re out, but we think our idea is better). Live the American dream with this USA-style fridge freezer, complete with filtered water and ice dispenser. The last word in luxury refrigeration, this LG model has everything, including an absolutely whopping 601 litre capacity to store every fresh and frozen food item you could possibly need to hand. The moisture-regulating crisper keeps your fruit and vegetables from going limp, and the ‘Multi Air Flow’ system circulates cool air continuously to avoid frost. Forget the KitchenAid mixer (sorry Bake-Off fans), this is the ultimate lust-have for retro kitchens everywhere. The iconic 50s-style design of the Smeg fridge, especially as seen here in a delightful Pepto-Bismol pink, proves that appliances needn’t be boring — but don’t be fooled by its sweet exterior. Featuring a 4* ice box for storing frozen goods, an impressive A++ efficiency rating, and auto defrost, it’s brains as well as beauty. This full-length fridge freezer offers two appliances in one for under £300, and, as such, phenomenally good value. It’s quite slender, but offers a surprising amount of space including a two-shelf freezer compartment, four shelves (plus four in the door) and a veg drawer — ample solution to most produce problems. An A+ for efficiency, low noise output, and auto-defrost are also excellent features for the price. The unique combination of doors on the Hotpoint Combi Quadrio might be maze-like at first, but you’ll be praising its innovative storage solutions in no time. The ice cube tray, while a nice feature, can be removed to maximise freezer space, and the two-door fridge means double the number of handy in-door compartments. It also includes a central wine rack which, by keeping the bottles lifted, helps air circulate all around for perfect chilling. With great build quality, ample storage for a handful of users, and superb levels of energy efficiency, this Siemens offering is our all-round winner for best value fridge-freezer. The fingerprint-proof stainless steel outer is attractive and easy to clean, and so are its removable glass shelves. Between the deep, humidity-controlled vegetable crisper drawer, the generous freezer and fridge compartments, and a built-in bottle rack, it’s easy to keep enough stuff to hand when you need it without overloading.